Arotrade is a forex broker. Arotrade offers Mobile and Desktop forex trading platform. 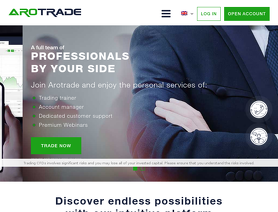 Arotrade.com offers over 50 forex currency pairs, indices, stocks, commodities, cfds, bitcoin and other cryptocurrencies for your personal investment and trading options. Ever since I Joined Arotrade > must say do not fall for the bad reviews floating about this company. They work with professionalism, and make you realize that every bit of your investment need special attention and guidance to make your profits. They have a dedicated accounts manager ( Anthony Rich in my case) dedicates patiently his time to ensure that you are comfortable and understand,that the money you invest will get you great returns,by investing wisely. I am a happy man with good returns with Arotrade. when you complain that you have lost every coin of your investment with AroTrade! due to unprofessional so called account manager (in may case Mr Anthony Brown), they will reply to you saying that we don't care about the dead fish! This email serves as a reply. Respecting your complaint regarding the negative results of your trading activity, we would like to allude to the Paragraph 5 of Terms and Conditions which clearly states that you are the person responsible for the trading outcome. We would like to emphasize that you had both unsuccessful trades and those that closed with a positive value of Profit and Loss which proves the statement about the risks involved in trading on the financial markets. You can get acquainted with the results of your trading activity in the "Reports" on the platform. It is beyond possible to exclude risks of trading on CFDs and Forex markets or build a risk-free environment. With that being said, we would like to bring your attention to the fact that warnings about risks are displayed throughout the website, in the Risk Disclosure Statement and in the Paragraph 26 of our Terms and Conditions that you have accepted upon registration with the Company. Moreover, we would like to emphasize, that the sessions with Account Manager provided to you by Arotrade had purely educational purpose and did not, in any case, contain any trading advice in accordance to the Paragraph 15 of our Risk Disclosure statement and Paragraph 9 of our Terms and Conditions. It is your responsibility to verify the reliability of the information on the Arotrade website and its suitability for your needs. We exclude all liability for any claim, damage or loss of any kind caused by information contained in the Company’s website or provided by Account Manager. We regret to learn about the trading experience you have faced and we understand your financial situation, however, as stated in the Terms and Conditions and Risk Disclosure, Arotrade cannot undertake a responsibility either for the losses, or for the trade actions done by you.